The latest version of Norton Security iterates on what came before it without changing much or introducing anything particularly new. Symantec is back with an overhauled version of Norton Security for 2019. Not a ton has changed since the last time we looked at Norton, but there are some differences worth noting, as well as a new look at the suite’s basic performance. For this review we’re looking at the top version of the suite, Norton Security Premium, which costs $55 per year for new users and $110 per year at the standard price. Beyond the usual antivirus packages, Norton Security also offers packages that include Lifelock Identity Protection—Symantec acquired Lifelock in late 2016. As I said last time, one of the first things you notice about Norton Security is that you don’t notice it. Once you install Norton, it goes about doing its job quietly. It doesn’t overload you with a bunch of pop-ups guiding you through its various features, or alerts about special offers, or anything like that. It just does its job, and lets you get on with yours with minimal interruptions. Norton Security’s interface is more or less the same as it has been for a few years now. At the top of the window is the current status of your PC. If it’s green and says, “You Are Protected” then you’re good to go. One new addition to this area is that it now lists how many of your Norton licensed devices are in use—Premium gives you the right to install the security software on 10 devices. Below the status area are four primary categories: Security, Online Safety, Backup, and Performance. There’s also a fifth category called More Norton with supplemental software. The status area above changes as you switch between categories giving you an overview of another aspect of your PC. When the Performance section is highlighted, for example, it shows a live count of overall CPU system usage and Norton CPU usage. Security (pictured above) is where you can run security scans, update the software, see your device’s history of recent security events, and an Advanced option for adjusting your various protection options such as the enhanced firewall, intrusion protection, email protection, browser protection, and so on. Overall, this section is straightforward and easy to understand. You can run a standard quick scan, a full system scan, a custom scan, or a custom task such as cleaning out temporary browser files, optimizing your hard disk (don’t do this to an SSD), and backing up files. There’s also Norton’s Power Eraser, which is supposed to delete particularly stubborn threats, and Norton Insight, a feature that assesses the files on your machine to determine which ones, if any, need to be monitored more closely. You can also view a diagnostic report that checks various issues such as whether there’s hardware that’s not working properly, whether your operating system is up to date, and whether you should review your startup programs. The Online Safety section of Norton Security Premium. Online Safety used to be called “Identity,” but the current name makes it clearer what this section is all about. There aren’t as many features in the newer version of Premium. The phishing protection setting is gone (phishing protection is not), but this is still the place to go to access Norton’s Password Manger, the password generator, and a quick link to Norton’s browser extensions. If you aren’t using a password manager already, you should definitely use the one included with a Premium subscription. The Backup section is a cloud backup with 25GB included for free in your subscription. Performance includes the usual extras premium security suites offer such as a hard drive optimizer, file cleanup, startup manager, and some performance reports. These are nice to have in one package, but as we’ve noted many times before, you can find these features for free as a part of Windows or as third-party utilities. 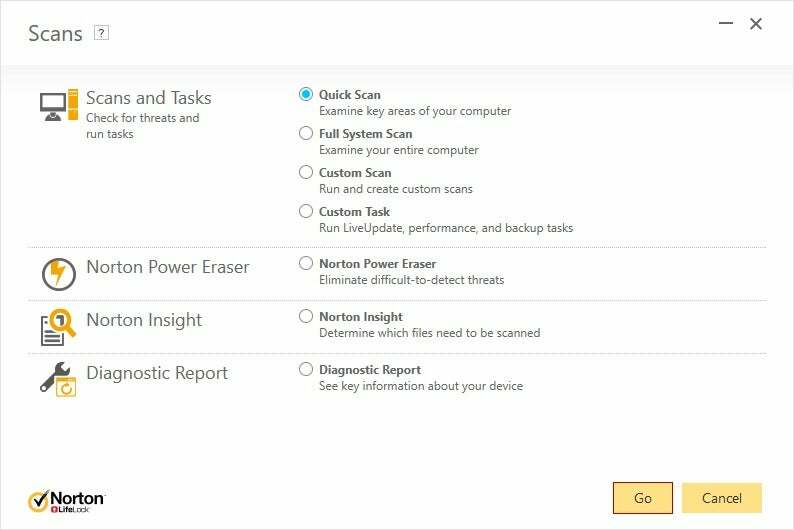 Finally, up at the top, Norton is still rocking its report card feature which offers a summary of key security actions on your PC. 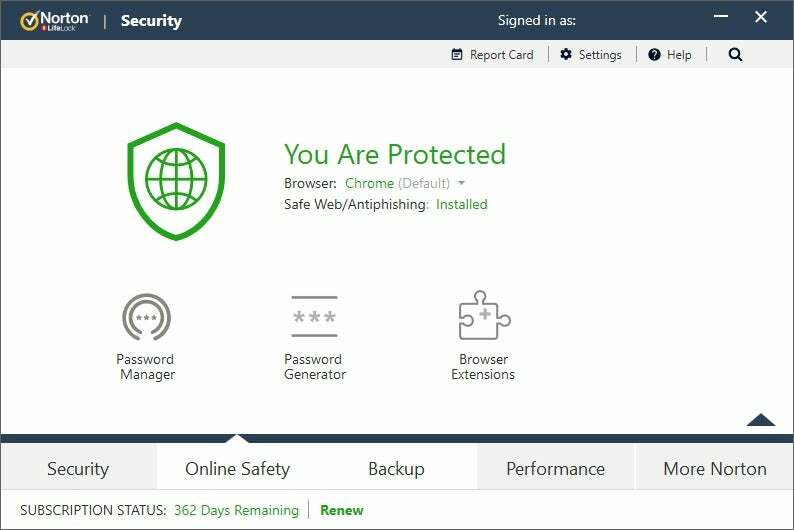 This is essentially the Norton Security Premium suite we saw last time around—same interface with some very minor additions and changes. That might be a good thing as Norton was already our top choice. Norton doesn’t have quite as many extra features as other security suites, but it does have all the more useful features we expect to see in suites like this one. Norton Security Premium’s scanning options. A-V Test’s September and October testing included Norton versions 22.15 and 22.16—the latter being the version of Norton we’re reviewing here. In both September and October, Norton earned a 100 percent rating for protection against 0-day malware including both web and email threats based on more than 300 samples. For its larger malware test with more than 21,000 samples, Norton also scored 100 percent in October and November. Moving over to AV-Comparatives and its real-world protection test, Norton blocked 99 percent of the 192 sample threats, with one false positive. For its September 2018 Malware Protection test with nearly 12,000 samples, Norton 22.15 scored a 99.9 percent online detection rate, a 100 percent online protection rate, and a pretty abysmal 81.5 percent offline protection rate. It also had 47 false alarms. For our performance tests, Norton improved performance slightly. The PC Mark 8 work conventional test went from 2,467 without Norton installed to 2,555 after a full system scan. Bigger is better in this test. 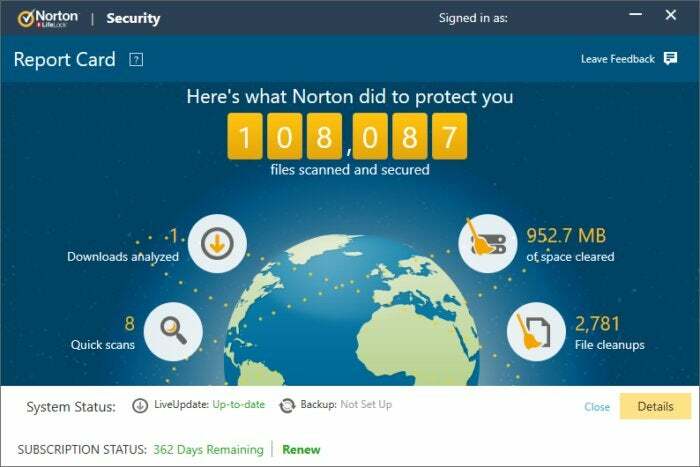 Norton Security Premium’s Report Card feature. For our file conversion test, I used an 8GB HD MKV video file, converting it to the Android tablet preset with Handbrake. Without Norton installed, the PC finished the job in two hours and 35 minutes. After a full system scan with Norton, that time actually went down to two hours and 26 minutes, a difference of nine minutes. The bottom line from all of this is that you shouldn’t expect a performance hit from Norton on Windows 10, and in some cases performance may improve. Instead of overhauling its system with something new, Norton Security Premium stuck with what it has already built and kept its detection and protection capabilities at a high level. It’s always nice to get something flashy and new, or at least a few added features, but that’s not what you get with Norton Security Premium for 2019. Instead, you get more or less the same thing you had last time with the same pricing. If you’re already using Norton, then there’s no reason to switch; and anyone looking for a new antivirus solution should seriously consider using Symantec’s excellent security solution. 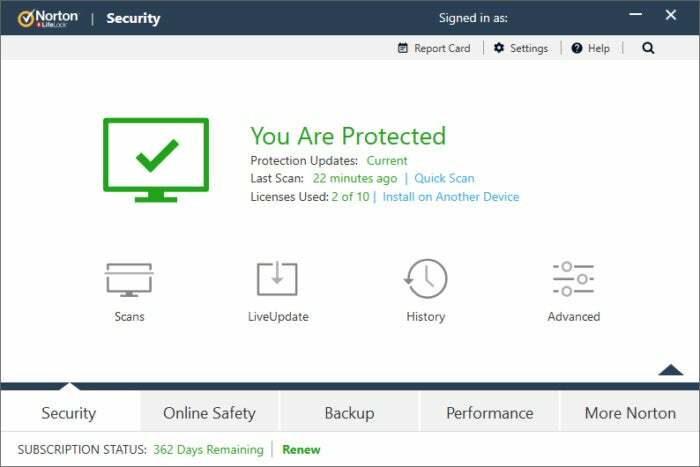 This story, "Norton Security Premium (2019) review: A minor revision of an excellent security suite" was originally published by PCWorld. 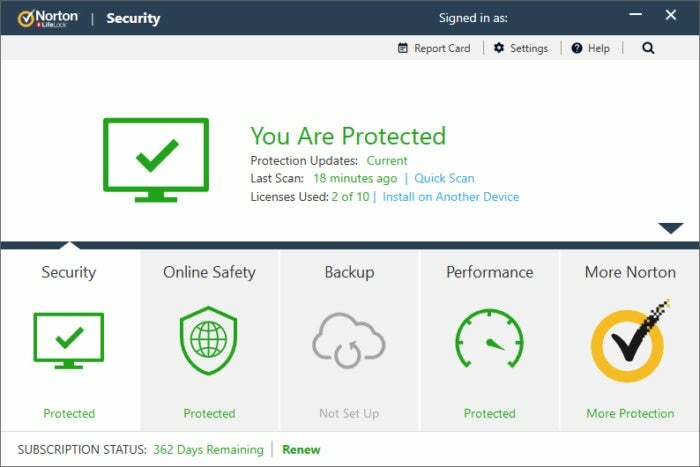 Norton Security Premium still does an excellent job of protecting your PCs, doesn't bother you too much, and has a very easy-to-use interface. Norton protection doesn't come cheap, however, at $110 per year for up to 10 devices.